SEO Bootcamp Class – Register Today! Katherine Watier Ong is an online marketing trainer, public speaker, and professional SEO consultant. She has over 20 years of experience in communications strategy and online delivery of communications messages, including ten years of SEO, social media, SEM, and web analytics management. Mrs. Ong was previously the VP of the Online Strategy team at Ketchum where she recruited, trained and led the online strategy team. Additionally, she provided online marketing services for Ketchum’s clients globally including NY State of Health, HHS, Express Scripts, Gazprom, Cleveland Clinic, Hershey, and others. For ONC, Katherine developed the digital strategy for the electronic health records (EHRs) national communications campaign – Putting the I in Health IT. 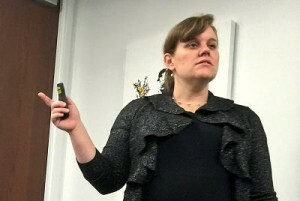 To ensure that health care providers find information about health information technology and EHRs regardless of how they search online, Katherine implemented a multi-channel integrated campaign to distribute messaging across numerous platforms (SEO, social, paid online ads, and a click-to-call campaign). She developed and managed all SEO efforts and online campaign measurement process for the campaign, which recently won 14 awards including PRWeek, SABRE and other communications industry awards. For the New York State Health Benefits Exchange, she created and launched social media strategy to support enrollments into the New York Health Benefits exchange, including launching a social media customer service team in partnership with their call center to aid in online reputation management for the brand and to drive enrollments. She later recruited, trained and helped hire a team located in their call center to manage the social media customer service work. Prior to Ketchum, she directed the online marketing efforts for Environmental Working Group (where she created an integrated online marketing strategy that increased the site’s traffic from 300 thousand to over 1.2 million visitors to the organization’s website in one month). Katherine previously served as Director of Online Marketing at the Environmental Working Group, where she created an integrated online marketing strategy that drove more than 1.2 million visitors to the organization’s website in one month (from the average of 300K/mo). And prior to EWG, as the Director of Marketing and Sales for 1-800-Volunteer.org at the Points of Light Foundation, Katherine took the 1-800-Volunteer.org software from a new-to-market product to the market leader in less than three years, with a 300% increase in website traffic. Katherine graduated from Georgetown University with an M.A. in technology marketing and business and received a B.A. in social psychology from Hampshire College. She started her public relations and online career while at Hampshire, where she hand-coded her first website and ran all public relations efforts for USDA Rural Development New England. You can also take her classes online via her SEO Bootcamp course or the Online Marketing Institute. Thank you so much, Katherine. Yours was the most relevant and useful webinar that I have participated in recent history. Thanks again! – Thea Becton, Grants Management Specialist, Points of Light Foundation. “I worked with Katherine when she was at Ketchum leading the digital strategy behind our “Putting the I in Health IT” campaign and training ONC staff on SEO, social media, and web analytics. Attending Katherine’s Google Analytics training was enjoyable and extremely useful as I was getting my feet wet in how Google Analytics works and how to use the data to adjust ONC’s digital strategy. Her enthusiasm for using data to make marketing decisions is infectious and I hope to work with her again in the future. Katherine is currently available for speaking engagements throughout the US. Join my Free Member Content Library and receive access to my 72 page Organic Traffic Decrease Guide.